Accusations of sexual misconduct by Brett Kavanaugh could derail the archconservative's nomination for the Supreme Court, according to a report in the New York Daily News. The unspecificed allegations are from Kavanaugh's high school days and involve a female, though Kavanaugh, 53, attended an all-male Jesuit high school in Maryland. The Daily News reports the claims were made in a letter obtained by Dianne Feinstein, California's Democratic senior senator and the ranking member of the Senate Judiciary Committee. A committee vote on whether to advance Kavanaugh's nomination to the full Senate was recently delayed from this week to September 20. Sen. Chuck Grassley, the Republican who chairs the Judiciary Committee, said there are no plans to delay it further in light of the new information. Feinstein found the allegations so concerning she sent them to “federal investigative authorities,” according to a statement from the senator. A congresswoman from California — Democrat Anna Eshoo — initially received the incendiary letter about Kavanaugh before sending it to Feinstein. The accuser requested confidentiality. 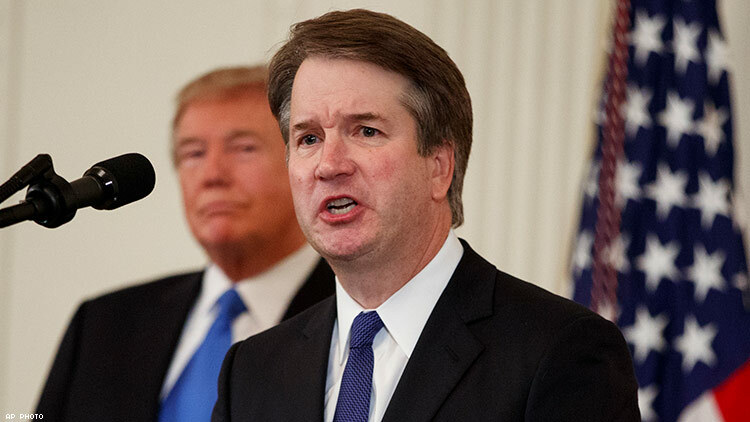 Trump nominated Kavanaugh, currently a federal appeals court judge, to succeed Anthony Kennedy, who has retired. Kennedy was the court's key swing vote and a champion of LGBTQ rights, having authored several important rulings, including the 2015 one that made marriage equality the law of the land. Kavanaugh's confirmation to the court could change its makeup for a generation. His nomination has raised alarm among supporters of LGBTQ rights, abortion rights, and civil liberties in general. During hearings before the Senate Judiciary Committee, he notably refused to say if it's wrong to fire an employee for being gay, when queried by Sen. Cory Booker. Sen. Kamala Harris could not get a direct answer from him about his feelings on marriage equality, and she stumped him when she asked if he knows of any law that regulates men's health care decisions. Advocates for reproductive rights fear Kavanaugh would be the fifth vote required to overturn Roe v. Wade, the landmark 1973 abortion rights ruling, if a case involving the issue comes before the Supreme Court. On the U.S. Court of Appeals for the D.C. Circuit, he dissented from a ruling allowing an undocumented immigrant who is a minor in federal detention to obtain an abortion. He also has generally sided with corporate interests over individuals. Kerri Kupec, a White House spokeswoman, "did not outright deny the allegations against Kavanaugh but blasted Democrats for introducing them so late in the process," the Daily News reports. “Not until the eve of his confirmation has Sen. Feinstein or anyone raised the specter of new ‘information’ about him,” Kupec said in a prepared statement. She also suggested, without offering evidence, that Senate Democratic leader Chuck Schumer was connected to the new allegations.